Access your content securely, anywhere, anytime. Improve your Bottom Line and Disaster Recovery Preparedness while Providing 24x7 Secure, Worldwide Access to Critical Data! DRS offers affordable Cloud Based storage and document management software with secure 24x7 worldwide access. This is a cost-effective solution for multiple office access, cost reduction, legal compliance, data mining and disaster recovery. Save space and money by taking advantage of the DRS document management software solution and hosting service. Provide your employees and customers with secure worldwide access on a 24x7 basis. Outside your budget and skill level? Don’t worry – our highly-skilled specialist will handle everything. Before you know it, your company will improve its bottom line by enhancing its information availability with our leading document management software. DRS can convert your paper documents, electronic and microfiche/film to PDF documents that are fully indexed for fast retrieval. 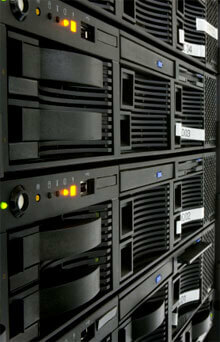 We provide you with a dedicated server at one of our facilities and a secure means of communicating with that data. All of the set-ups, ongoing work and maintenance are managed by the DRS professionals. Outsource the capturing, managing, storing and Cloud SaaS delivery of key documents to DRS. Our secure and cost-effective and compliant document management software (ECM) solution can be working for your company within a short amount of time, increasing the positive impact on your operations, efficiency, customer satisfaction, improving productivity and employee morale. Accessibility is by authorization only. You control who gets to see what. Employees and customers now have worldwide online access to retrieve the information they need now, without having to go through the corporate office. This is especially beneficial for remote branches, sales and support people, and foreign offices. Single point of access for information and documents residing on disparate systems in a variety of formats. Management reports are easier to create and distribute. Data mining can provide insights on operations or improve business decisions. It is easier to prove compliance with legal requirements or to address a lawsuit when critical information can be quickly located and made available. Disaster preparedness is enhanced by storing critical information offsite. Even if a natural or man-made disaster strikes your facility, company operations will continue because employees and customers still have access to critical information. Outsourcing this function saves money compared to establishing an in-house capability, hiring skilled personnel and maintaining the document management software solution over the years with equipment replacements and hardware/software upgrades.